In this photo, the 402-ton nuclear reactor vessel head for the Haddam Neck nuclear power plant passes the New York City skyline on March 29, 1966. Haddam Neck was a pressurized water reactor located in Meriden, Conn. When was it shut down? Photo courtesy of the former Atomic Energy Commission. Thanks for the prompt informative specific response. My suspicions were unfounded. Glad unrestricted use is just that. I now believe “greenfield” and “unrestricted use” mean the same thing. “Unrestricted use” means just that: The NRC no longer places regulatory restrictions on the use of the property, and the license is terminated. (Note: The dry cask spent fuel storage facility, if one exists, remains under license and NRC regulation for safety and security requirements.) The licensee still owns the site, and since infrastructure is in place, several sites have been repurposed to non-nuclear power generation. At least two sites, Maine Yankee and Big Rock Point, are public parks. We know of no decommissioned nuclear power plant site that has been used for agriculture; however, there is a vineyard directly adjacent to Rancho Seco (as well as a state park). Thanks for the link but I found nothing there that answers my previous questions. Please answer my questions or refer me to material that has the answers. An additional question: To the best of your knowledge, has any former nuclear power plant land that has been “released for unrestricted use” actually been used for agricultural purposes? Thanks for setting me straight and thanks for serving as a licensed senior reactor operator. Your comment is posted here as it is related to the blog post. We have lots of information on decommissioning here: http://www.nrc.gov/waste/decommissioning.html including the status of decommissioning plants and explanations of decommissioning options. The company that owned the plant was the “Connecticut Yankee Atomic Power Company” which had 8 joint owners. The plant was called formally Haddam Neck Unit 1(Unit 2 was never built.) Connecticut Yankee, as it was commonly known was not a troubled plant. It was taken off line in July of 1996 due to an engineering study that determined that the plant was not in compliance with it’s technical specifications. Changes to the plant were underway to bring the plant back into compliance when the joint owners determined that the plant could not compete with the then low priced natural gas powered units. I was a Senior reactor Operator at Conn Yankee at that time. Thanks for providing the accurate info on Conn Yankee. In looking more at this decommissioned nuclear power plant (NPP), I was pleased to note that a large portion of the Conn Yankee site (as a result of decommissioning work) has been released for “unrestricted public use”. I also noted that the term “greenfield status” has been used after decommissioning activities are accomplished. Is there a difference in the two terms used? Does unrestricted use also mean that the land itself can be thought of as now once again a rural area? That is, can the land so released be used for agricultural purposes? Can farmers now cultivate and grow crops on the land if the utility owner rents or sells the unrestricted land to them? Or are there still some restrictions on the use of the land? I will also post this on the open forum if you feel this is too far off-topic. Would appreciate a response here or there. Thanks. 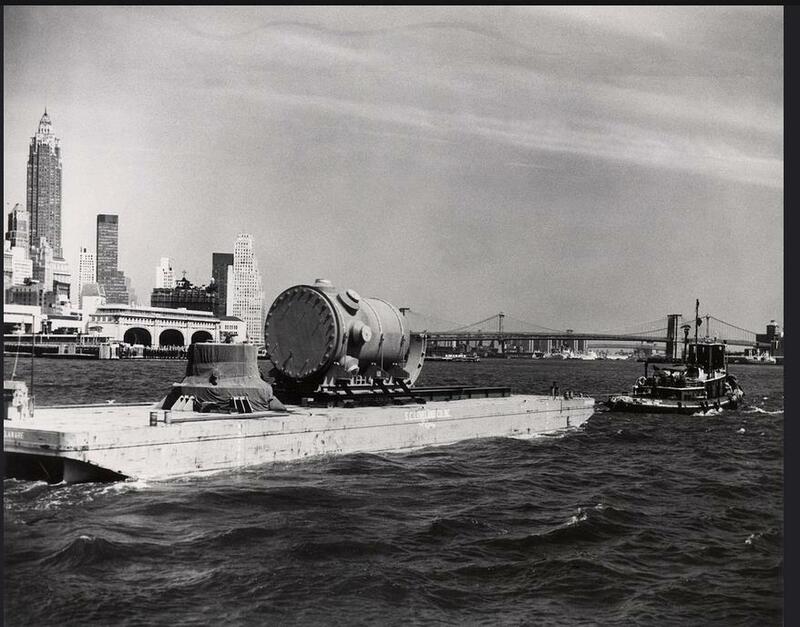 The other object on the barge is the reactor vessel head. The city of Meriden Ct is twenty miles from Haddam and Haddam Neck CT. Besides info on Conn Yankee you can get good info on other NPPs. There is an ehaustive list of NPPs in the US that are licensed to operate; that are closed; that were cancelled; and those that are planned (just a few). I never realized just how many NPPs have been closed down or cancelled. I didn’t bother to count all of them but it appears that the list is as long as the list of plants with operating licenses. What other capital-intensive industry can afford so many unsuccessful ventures?! No wonder electric bills are out of sight! Unfortunately, utility customers take it in the shorts and yet a few utility companies continue to pursue the nuclear option. Go figure! The other thing about nuclear plants is that they leave a long-lasting, dangerous legacy even after you get the expensive, unsafe things shutdown. All the used, highly radioactive fuel is stored at many locations all over the continental US as our government, “lead” by the DOE and the NRC, still has not constructed a safe, remote, underground storage facility to “isolate” this waste for hundreds of years. Other non-nuclear production facilities have never been built and operated without due regard for how to properly handle the end wastes produced. But our elite nuclear minds never bothered to deal with the waste issue in their rush to provide “nuclear power to cheap to meter”! How sad and tragic! I’m confused. Wasn’t the plant’s name Connecticut Yankee and its location Haddam Neck, CT? The other commenter is right, the large piece on the barge is reactor vessel not the reactor vessel head. You also neglected to mention why a plant designed for at least 40 years of operation only made it 28 years. The official utlility explanation for the shortened life is that it could no longer compete economically with cheap oil and especially cheap natural gas fired units. An equally important reason was that Conn Yankee was shutdown for safety reasons. At the time all four nuclear units in CT were considered troubled plants. Funny as you look back how easy it must be for you to disregard inconvenient truths. At the time Haddam Neck ceased operating on Dec. 5, 1996, Northeast Utilities partially owned the company holding the license to operate the plant. The license for the majority of the site was terminated in November 2007, when we issued a press release (http://pbadupws.nrc.gov/docs/ML0733/ML073300502.pdf). The picture is of a reactor vessel and it’s support pylon(?). The plant was operated by Northeast Utilities. I think that a more correct answer is that the Operating License was terminated on Dec 4, 1996. Correct — 18 years ago tomorrow. Follow-up question: What company operated the plant?